The Progress 50 robotic supply ship approaches the International Space Station during the fly-around prior to docking on Feb. 11, 2013. This story was updated at 3:40 p.m. EST. An unmanned Russian spacecraft carrying nearly 3 tons of supplies arrived at the International Space Station Monday (Feb. 11) less than six hours after blasting off. 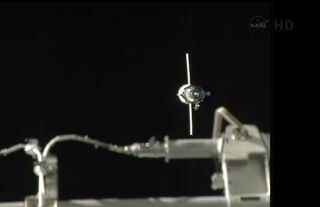 The robotic Progress 50 resupply ship docked with the orbiting lab at 3:35 p.m. EST (2035 GMT) Monday after launching from Baikonur Cosmodrome in Kazakhstan at 9:41 a.m. EST (1441 GMT). Such unmanned cargo trips have traditionally taken about two days. The Progress 50 spacecraft is packed with about 2.9 tons of supplies for the space station's six-man Expedition 34 crew. On Saturday (Feb. 9), the station astronauts discarded an older unmanned cargo ship, called Progress 48, in order to make room for Progress 50. Progress vehicles are designed to be disposable and are intentionally ditched into Earth's atmosphere at the end of their mission. Robotic resupply ships for the station built by Europe and Japan are also disposed of in the same way. The only robotic supply ship for the space station that can return supplies back to Earth is the Dragon space capsule built by the private spaceflight company SpaceX. Dragon space capsules visited the space station twice in 2012, with the next one slated to launch from Florida atop SpaceX's Falcon 9 rocket in March. Dragon vehicles are equipped with a heat shield to protect them during re-entry and are built for ocean splashdown landings in order to return experiments and other gear to Earth. The space station's current Expedition 34 is commanded by NASA astronaut Kevin Ford. The other crewmembers are fellow NASA spaceflyer Tom Marshburn, Canadian Chris Hadfield and Russian cosmonauts Oleg Novitskiy, Evgeny Tarelkin and Roman Romanenko. Hadfield will become the first-ever Canadian to command a station mission when he takes over Expedition 35, which will begin in March with the departure of Ford, Novitskiy and Tarelkin.